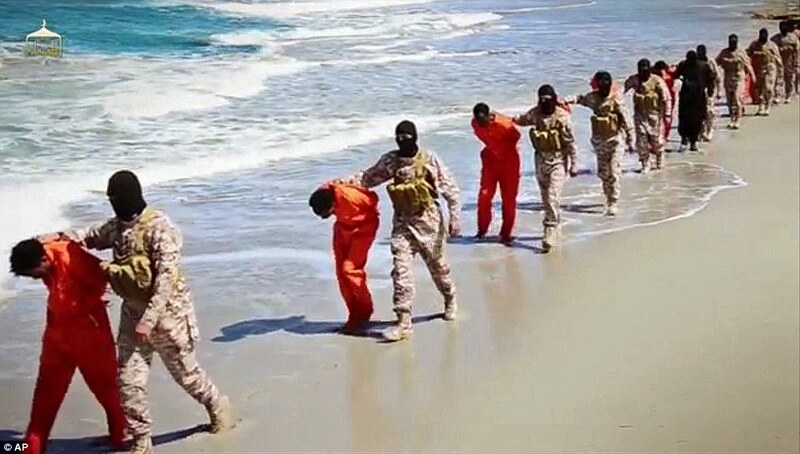 A shocking new video appearing to show at least 30 Christians being beheaded and shot by ISIS in Libya has been released. The 29-minute video, titled ‘Until It Came To Them – Clear Evidence’, shows dozens of militants holding two separate groups captive, thought to be in the south and the west of the country. 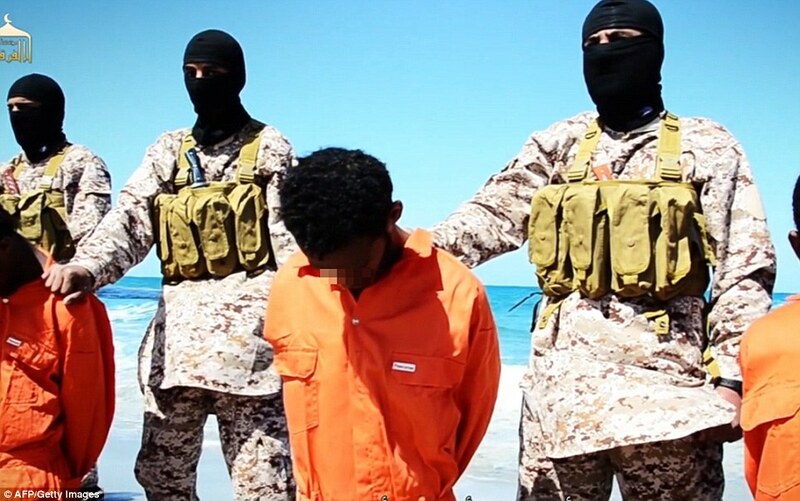 At least 16 men, described by Islamic State as the ‘followers of the cross from the enemy Ethiopian Church’, are lined up and shot in a desert area while 12 others are filmed being forced to walk down a beach before being beheaded. 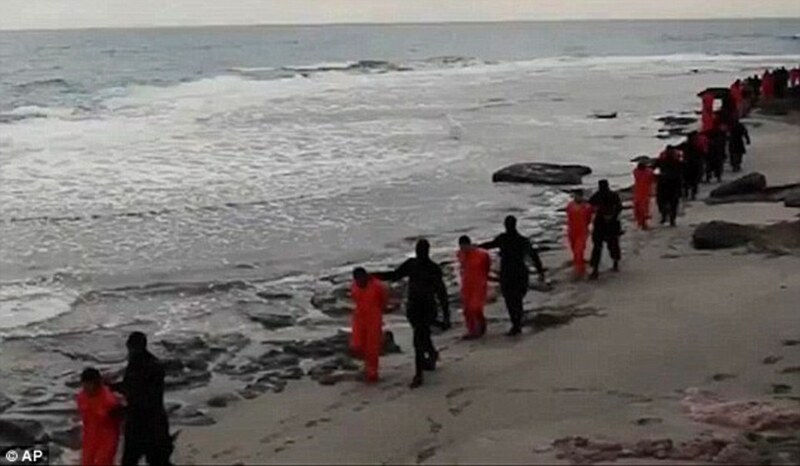 This follows another video in February of the beheading of a group of 21 Coptic Christians on the beach in Libya, though that terrain was rockier than the one shown in the latest film. It raises fears that ISIS is consolidating its presence on the ‘doorstep of Europe’, as Libya is just a few hundred miles from the coast of Italy. Ethiopia was unable to confirm its citizens were killed in the footage but condemned the ‘atrocious act’, a government official said. 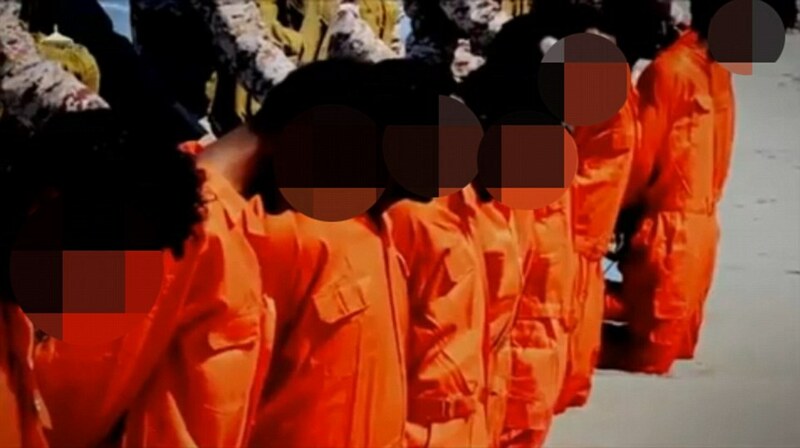 The video shows the men at the coast wearing Guantanamo-style orange jumpsuits and being held at the neck by fighters in combats with balaclavas covering their faces. The victims inland are forced to kneel as militants dressed in combats and green masks stand behind them holding rifles. It starts with what it called a ‘history of Christian-Muslim relations’, which includes scenes of militants destroying churches, graves and icons. 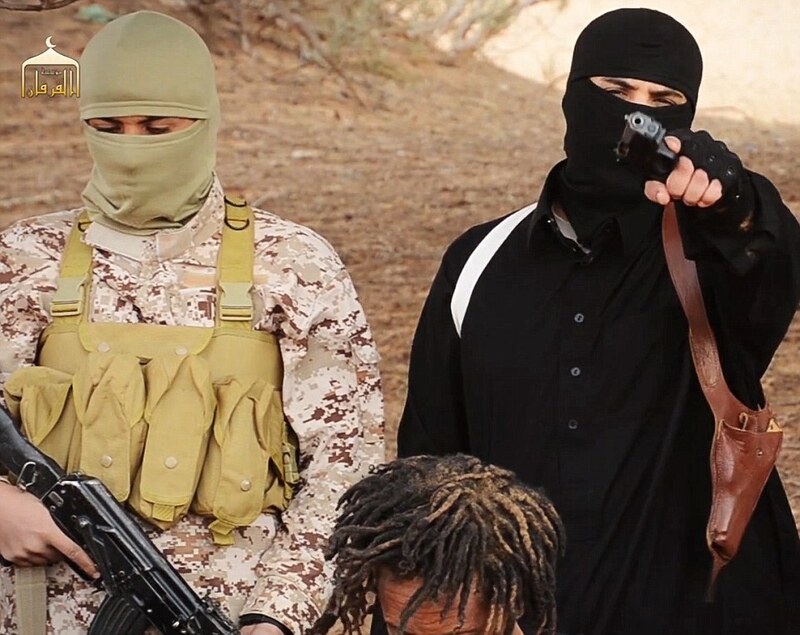 A masked fighter in black then brandishes a pistol as he vows to kill Christians if they do not convert. The footage, which was released on websites and social media accounts officially linked to ISIS, also cuts to Christians in Syria explaining how they were given the choice of converting to Islam or paying a ‘special tax’. At the end it switches between the two sets of captives – thought to be mainly migrant workers – with one group shot dead at point-blank range and the others beheaded on the beach. The video has not yet been verified. Ethiopia is a predominantly Christian country with the religion being introduced in the country the 4th century, making it one of the oldest Christian states in the world. The Ethiopian Orthodox Tewahedo Church is one of the oldest organized Christian bodies in the world, and more than 40 per cent of the population are members of the church. Around 20 per cent of the population follow other branches of Christianity, a majority being Protestant. Islam was not introduced in the country for another 300 years, and now about one third of Ethiopians identify as Muslim. Initial reports did not make clear who the captives were or when they were captured. The video bore the official logo of the IS media arm Al-Furqan and resembled previous footage released by the extremist group. 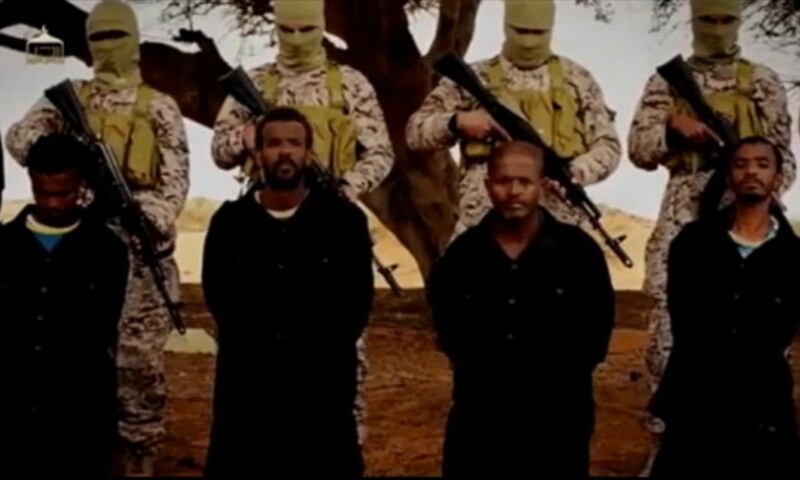 Redwan Hussein, an Ethiopian government spokesman, said officials were in contact with its embassy in Cairo to verify the video’s authenticity. He said he believed those killed were likely to have been Ethiopian migrants hoping to reach Europe. Libya has become a hub for migrants across Africa hoping to cross the Mediterranean to enter Europe for work and better lives. ‘If this is confirmed, it will be a warning to people who wish to risk and travel to Europe though the dangerous route,’ Mr Hussein said. He added that Ethiopia, which does not have an embassy in Libya, would help repatriate Ethiopians if they wanted to leave. Libyan officials were not immediately available for comment. Abba Kaletsidk Mulugeta, an official with the Ethiopian Orthodox Tewahdo Church’s Patriarchate Office, said he also believed the victims were likely to have been migrants. 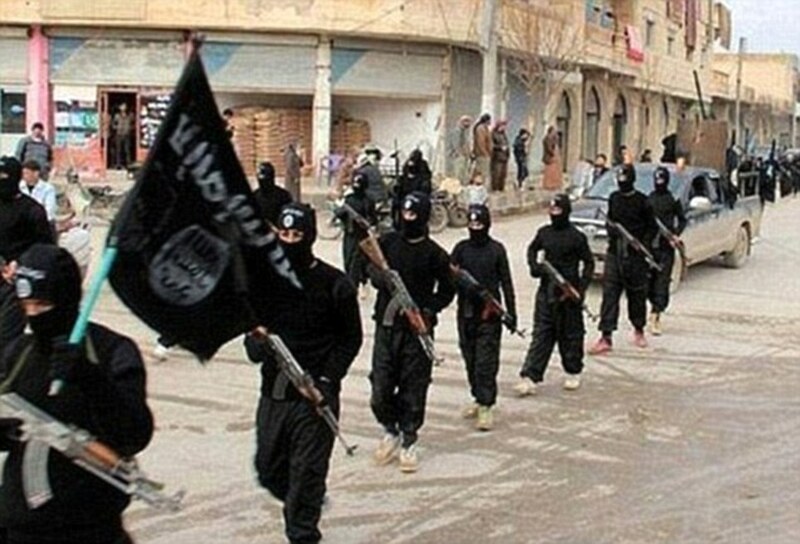 ‘I believe this is just another case of the IS group killing Christians in the name of Islam. Our fellow citizens have just been killed on a faith-based violence that is totally unacceptable. This is outrageous,’ he said. Ethiopia’s options to retaliate remain slim, given its distance from Libya. However, Ethiopian Ambassador to Egypt Mohammed Edrees said his country could partner with Cairo to strike the militants. 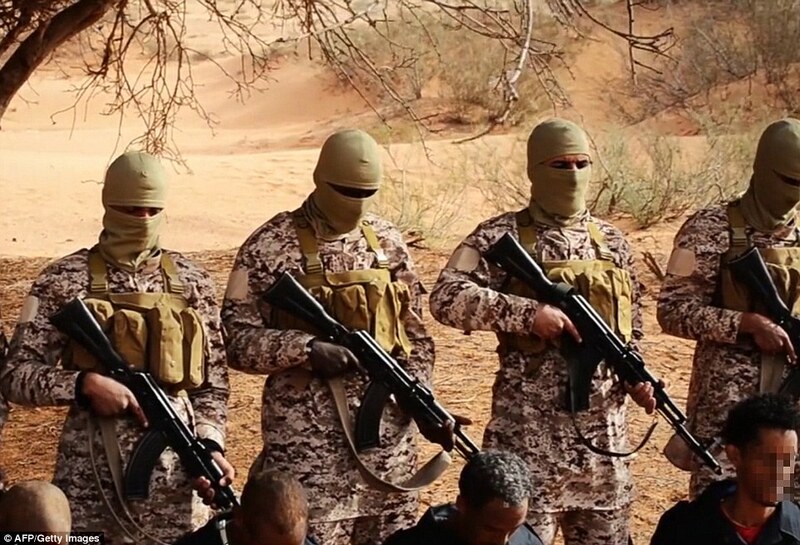 It comes just two months after IS militants filmed themselves beheading 21 captured Egyptian Christians on a similar beach, which immediately drew Egyptian airstrikes on the group’s suspected positions in Libya. ISIS has been able to gain a foothold amid chaos in Libya, where two governments backed by rival alliances of militias are battling each other as well as extremist groups. The group is also advancing in Iraq, where it has captured three villages near the city of Ramadi. More than 90,000 people have fled the ISIS’s advance in Anbar, a United Nations humanitarian agency said earlier this morning. The Office for the Coordination of Humanitarian Affairs said in a statement that civilians are fleeing Ramadi as well as the three nearby villages captured by the IS group a few days ago. Iraqi officials in Anbar have described Ramadi as a ghost town, with empty streets and closed shops. Iraqi troops backed by Shiite militias and U.S.-led airstrikes managed to dislodge ISIS, which controls large parts of Iraq and Syria and wants to redraw the map of the Middle East, from the northern city of Tikrit earlier this month. But the troops have struggled against the militants in Anbar, which saw some of the heaviest fighting of the eight-year U.S. military intervention that ended in 2011. Elsewhere today, the US-led coalition said Kurdish forces recaptured 11 villages in Iraq’s Kirkuk province from ISIS following days of intense clashes. The coalition said the area of about 25 square miles (65 square kilometers) was south of the city of Kirkuk.